It’s that time of the year again. Your beloved pet is another year older and just as adorable as the day you brought him home. 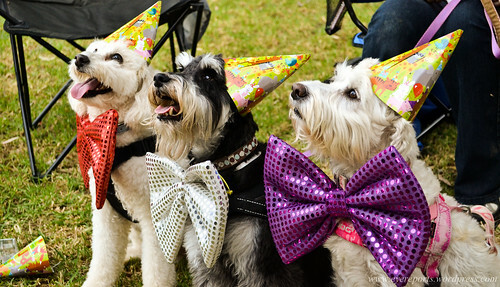 Celebrate your pup’s big day by throwing your pet a birthday bash that will get his tongue hanging and his tail wagging. 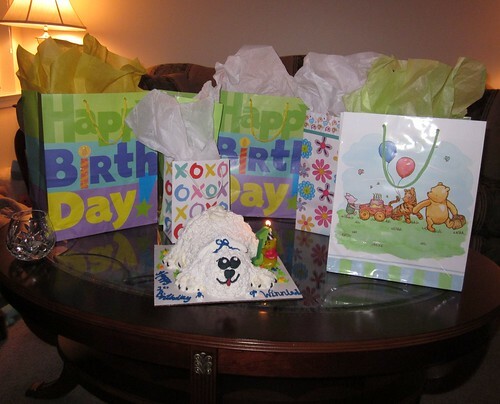 According to an online survey by Kelton Research involving more than 1,000 pet owners, 81 percent of dog owners know their pets’ birthdays, and 77 percent have celebrated the event by buying their pet a present. Show your dog how much you appreciate all the laughs and happiness he brings to your life by throwing him a birthday party. If your pet is dog-friendly, be sure to invite some other canine pals and their owners. Keep the guest list small to avoid stressing out the dogs. Consider making handmade invitations with your pet’s paw print or picture, or order customizable dog party invites online. Be sure to provide the date, location and time of the party in the invite. Also state that no aggressive pets are welcome and to bring a leash to the party. Create an appetizing menu for both the pets and their owners. For human food, consider serving hot dogs with all the fixings, side dishes served in new, clean dog bowls, and bone or dog-shaped cookies, brownies and other goodies. For your canine guests, offer homemade dog biscuits and treats. Also have a cooler of cold water available and disposable dishes to serve the pets. To truly pamper your pet, consider making a “fine wine” for the pooches made with meat juices and beef broth. 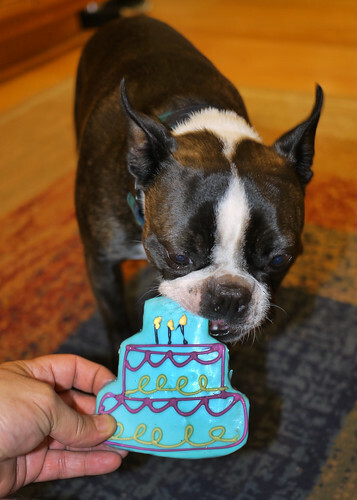 Whether you’re celebrating your dog’s birthday in your home, backyard, or at a nearby dog park, take the time to arrange a few decorative items. Abouquet of flowers on each table is a simple, beautiful way to decorate. Just be sure to choose pet-safe, non-toxic flowers in case your pooch sneaks a taste, such as African daisies, African violets, alyssums, snapdragons, Easter daisies, orchids, or roses. Cut fire hydrants, bones and other dog-appropriate shapes out of poster board and hang them from the ceiling or from trees. You can even dress up your dog for the party. Consider purchasing a new fancy collar or a dog-tuxedo shirt. Dogs may not be able to enjoy human cake, but they can have their own doggy version of a birthday cake. Dog-friendly cakes can be created from a combination of whole-wheat flour, peanut butter, vegetable oil, eggs, crushed dog biscuits, fresh veggies, and chicken stock. Many stores and bakeries now offer pet-appropriate cakes that are safe for dogs to eat and contain ingredients that your dog will love. Keep your guests busy by playing a few games and activities. Host a doggy talent show and allow each dog to show off their favorite talent or skill. Give each winner a treat or stuffed dog toy as a prize. Dogs and their owners will also enjoy searching for dog treats hidden in the house or yard. If the party is outside, consider having Frisbees and tennis balls available for dogs and their owners to play. Dogs are certainly not picky when it comes to gifts. Consider giving your dog a new leash or collar, a comfy harness or a new dog bowl. Your pet may also enjoy new toys, treats or stuffed animals. If your dog already has plenty of toys and treats, consider making a donation to ASPCA in their name. Make favor or “doggy” bags for the party guests to take home. The ASPCA recommends providing dogs with KONG toys, which are non-toxic and provide pets with a healthy outlet for their natural desire to lick and chew. Also in the doggy bags, provide a small bag of treats to stuff inside the KONG, as well as dog biscuits, a custom tag for each dog’s collar, and other goodies.